Both NAIA Terminal 3 and 4 will feature a festive décor of lights and gift boxes which reflects the merry and festive feel during the Christmas season. The NAIA Terminal 3 Departure area will be a giant gift box decorated with lights where travelers can have fun with emoji boxes and a wall travel holiday mural, while at the Arrival area, baggage conveyor belts will be decorated with Christmas trees made from piled gift boxes; and at the "salubong," or greeters and well-wishers area, a tall Christmas tree made of piled-up gift boxes set against a backdrop of lights. The NAIA Terminal 4, on the other hand, will be decorated with colorful lights at the check-in area, Christmas trees at every column at the boarding gates and baggage claim areas; and a texturized wall of gift boxes where passengers can take photos. Passengers arriving in Manila will be treated to a unique performance of Christmas carols from some of the Philippines' best beatboxing and acapella groups at the NAIA Terminal 3 arrival area such as Syncofellas, Conchords and MVibe. has enabled travelers from all walks of life to reconnect or bond with friends and family over the holidays—creating precious holiday moments and memories. 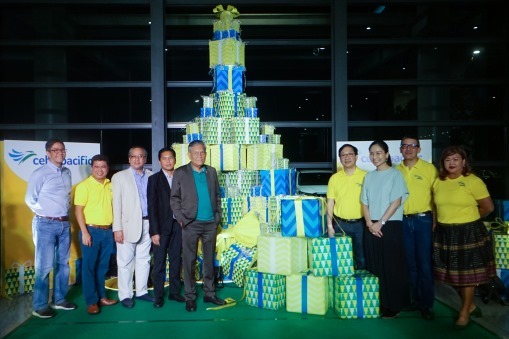 Aside from the festive décor, CEB has also invested in additional facilities at the NAIA Terminals to improve passenger experience, especially as the peak yuletide travel season begins. These include passenger boarding ramps and airport operation mobile applications to streamline check-in and inflight operations. The airline also took delivery of an additional two brand-new aircraft—an Airbus A321CEO (Current Engine Option) and an ATR 72-600 aircraft, just in time for the peak season.